One might not think of Philadelphia as lacking in racial diversity and yet panelist Jonathan Maberry described his experience growing up in the Kensington section as “isolated from diversity.” In fact, it was a comic book series, Fantastic Four, which first opened his eyes to South African apartheid. Maberry, a Bram Stoker Award winner and Marvel Comics writer, was one of four panelists at the Nov. 11 “Comics Go To College” event at Falvey Memorial Library. They were there to discuss the ways in which graphic novels and comic books are viewed by academia, publishers, writers, illustrators and readers. 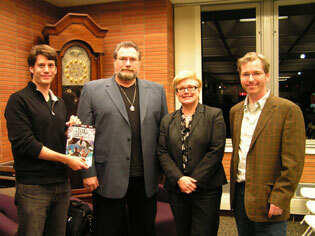 The panelists shared the pivotal moments when they discovered their fascination with graphic novels and comics. Matt Phelan, a children’s book illustrator and recently published graphic novelist, recounted for the group his approach to writing his first graphic novel, The Storm in the Barn. His was a process of trial and error that began with the “three worst pages of prose” ever written and resulted in an award-winning graphic novel. Villanova graduate student Brian A. Lynch, who helped plan the event, explained how his job at Showcase Comics sparked his interest in creative writing. Lynch has already produced his first short comic strip, “Fury,” which will appear in an upcoming anthology, Layer Zero: Survival. Offering an academic perspective, Mary Beth Simmons, director of the Villanova Writing Center, recounted her first teaching experience that included Art Spiegelman’s Holocaust graphic novel, Maus: A Survivor’s Tale. Simmons continues to incorporate graphic novels in her teaching syllabus at Villanova. The evolution of comic books can be traced from the early days of Archie & Friends and Fantastic Four to those that feature more complex characters and settings, such as Black Panther whose newest hero is an African black woman. Graphic novels also offer us a wide range of characters and issues, but in a more concentrated format. What distinguishes the graphic novel from the comic book? The Oxford Companion to English Literature offers that graphic novels are “more complex single works of sequential art conceived as a unified work,” whereas comic books are “periodical” in nature. As Maberry pointed out, the characters in graphic novels and comic books are very similar to the “heroes, gods and monsters” that populate scholarly literature. Simmons championed the use of graphic novels in the curriculum. She described graphic novels as filled with very human, angst-ridden themes and dysfunctional characters, and claimed that, as such, they can be deemed literary. 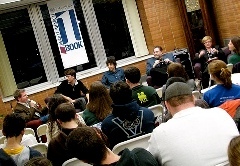 The panelists agreed that artwork provides what Phelan called the “connective tissue” in the story, allowing the reader to interpret silences as the unspoken thoughts of the characters. Phelan, Maberry and Lynch concurred that writers and illustrators work on a basis of trust in the collaborative production of graphic novels and comic books. Writers trust the illustrator to show components of the story that are not explicitly written as narrative. Maberry also felt that comic books and graphic novels are a bridge between traditional literature and the different types of learners. Categorizing these works has primarily fallen to the publishers and booksellers. In fact, the panelists agreed that marketing is what led to the label of “graphic novel.” When asked about future trends, Maberry proposed that redemptive and inspirational characters would become more prevalent, especially as the world deals with economic and political upheaval. Phelan hoped that in 50 years people would say “That was a great book,” without differentiating between the novel and the graphic novel. One day the graphic novel will no longer be a novelty, but just another book on the shelf, or in the hands of a reader. Stephen Spatz, assistant outreach librarian, guided the discussion and invited questions from faculty, staff and students, including English professors Karyn Hollis and Hugh Ormsby-Lennon. Laura Hutelmyer, Brian A. Lynch, Judy Olsen, Joanne Quinn, Natalie Tomasco and other members of the Falvey Publications & Communication team, with support from the Programming & Outreach team, planned and facilitated this event. As an added feature, graphic novels were placed on display by the panelists and by students in Dr. Hollis’s “Reading and Creating the Graphic Novel” course. Joanne Quinn and Laura Hutelmyer gathered many of Falvey’s graphic novel titles for an ongoing display at the library entrance.